This piece is in excellent condition with a case that is unbelievably nice. The finish is original and beautifully polished, making this clock one of the nicest clocks offered in this auction. I love running my hands over clocks like this - the finish is so smooth, even my hand can recognize the underlying quality. It is always difficult to get the proper perspective for clocks when looking at pictures. This clock, with its 38 inch overall length, is probably smaller than you realize from the photos. With nearly 6 inches of its overall length in the headpiece, this clock really is a little gem. And, even though it is short, it still runs a week! For me there are two ways to look at a clock - the individual features, and the way the clock goes together. This clock shines in both lights - with exquisite details that bespeak an exemplary maker, to the overall fit - the way all the bits fit together, and are right to go together. Details - the ornate pendulum slot plate, the beautifully-pierced pendulum crutch, the matching pulleys, the wall stabilizers that have are different from any I have seen before, the locking door with key - very unusual on so small a clock, all of the glass is old and wavy: Everything pointing to the effort and time that went into making this clock, and the stunning condition in which we find it today. Note the very delicate and exquisitely pierced hands: These hands are works of art. 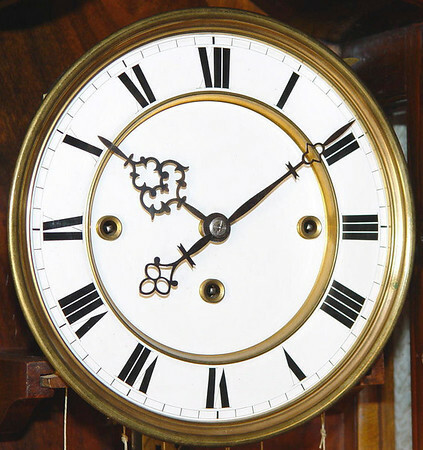 The pendulum bob is zinc backed, the dial in perfect condition with no hairline cracks: Getting to know this clock is like exploring a treasure chamber - every time you look at another feature you are surprised and pleased by the quality. And, being a shorter clock, the mechanism has to be a step up from the norm, since the clock has to make due with a shorter weight drop than found in the typical Vienna Regulator. While not freshly cleaned, the mechanism runs, and shows all the quality one would expect from a Viennese-made piece. If you are looking for a beautiful example of the Serpentine style of Vienna Regulators you really should consider this piece.